Back a couple of month's ago we featured an exotic Honda named "Fan Dancer" from Tom Summers shop in Minneapolis. At the time we made sure you were aware that Tom handles street bike building and that the wild scoots like the "Dancer" are strictly for show and advertising purposes. OK for those of you who requested information on his street bikes and their availability here's a shot at one of his latest bolt together four bangers. 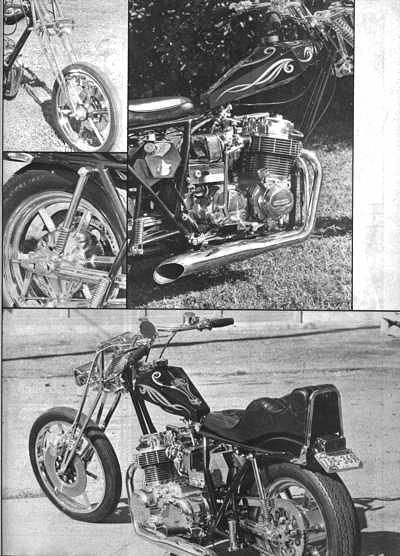 The bike you see here was constructed for Todd Smith of Minneapolis over a 3 month period whit a total cost of $3500. As you can see the bike was build to be a rider and incorporates the latest and finest street worthy hardware. The frame retains its ride with the Honda rear section which was fit with SB&F shock struts. Suspension up front is handled by a SB&F girder with a 3" stretch. Super clean lines can be attributed to the hardhead section once again fron SB&F. 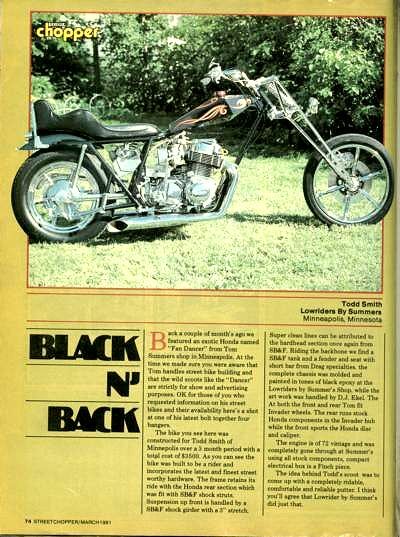 Riding the backbone we fine a SB&F tank and fender and seat with short bar from Drag specialities. The complete chassis was molded and painted in tones of black epoxy at the Lowriders by Summers's Shop, while the art work was handled by D.J. Ekel. At both front and rar Tom fit Invader wheels. The rear runs stock Honda components in the Invader hub while the front sports the Honda dixc and caliper. The engine is of a 72 vintage and was completely gone through at Summer's using all stock components, copact electrical box is a finch piece. The idea behind Todd's scoot was to come up with a completely ridable, comfortable and reliable putter. I think you'll agree that Lowriders by Summers did just that.